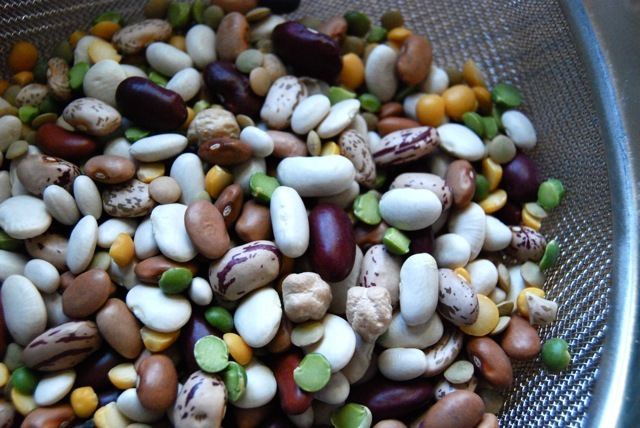 Beans are such a fabulous source of protein, as well as other vitamins and nutrients. Only problem? She’s reluctant to eat them. I’ve made many bean-inclusive dishes over the years, most recently sharing bean and barley soup, sweet potato and black bean burritos, salmon with mango and chickpea salad, and tuna and white bean salad. All completely acceptable on her new pescetarian diet. Only problem? She’s great when it comes to the fish, but she’s never taken to the beans. My daughter loves tofu and edamame, both excellent meat alternatives. And she’ll eat peanut butter without jelly. But she’s going to need more variety. My mission? To get my older daughter to EAT HER BEANS! Beans are cheap and abundant. Whether purchased dry and soaked overnight, or ready-made in cans, I keep lots of them on hand. And whether buying in bulk or preprocessed, Whole Foods is my go-to store. Some complain that Whole Foods is too expensive, but when you purchase selectively you can do very well shopping there. Beans are a perfect example. Whole Food’s sells a house brand called 365 Everyday Value, and their 365 Everyday Value canned beans are truly a steal. Whereas most grocery stores might have a single type of no salt added canned beans, Whole Food’s sells four different kinds! 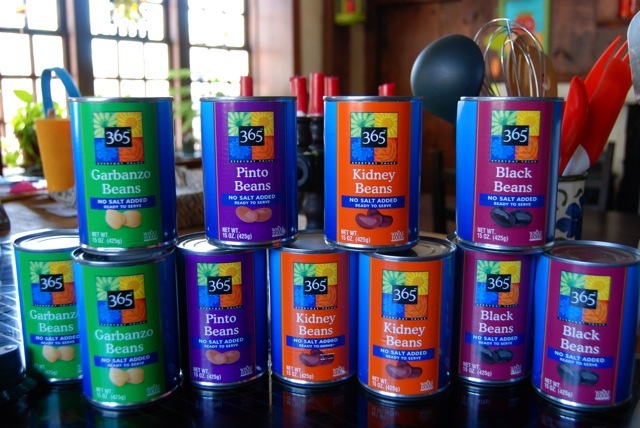 365 Everyday Value No Salt Added Garbanzo Beans, Pinto, Kidney and Black – all top quality and delicious – for a mere 89 cents a can. You heard me! 89 CENTS. A CAN. Most of the organic, no salt added beans I find in supermarkets or online sell for (on average) $2.49 a can. Compared to those, that’s savings of $1.60, almost TWO EXTRA CANS OF BEANS. It’s like buying 3 for the price of one. They aren’t organic, so that makes a big difference, but at 89 cents a can I’m willing to go conventional on this item. Not surprising, I go to Whole Foods and stock up, buying 12 cans or more at a time. Often the clerk and bagger look at me a little funny, but I don’t care! The bottom line is, I need your help. It take a village to raise a child after all, and it’s been a long time since I was a vegetarian. If you have any kid-friendly bean recipes (or other veggie dishes) that would also fit with my strict low sodium diet, I’d be so grateful if you’d share them below. Thoughts? Ideas? I’d LOVE to hear from you! THANKS SO MUCH!! This entry was posted in From the Kitchen and tagged 365 Everyday Value, BEANS!, Pescetarianism, Vegetarianism, Whole Foods Market. Bookmark the permalink. 11 Responses to Beans, Beans, the musical fruit! Couldn’t agree more, Christy! Maya is a Pescetarian too–she has been for over 8 months now and she’s very happy with it, but there is a great deal of us talking to her about balancing her diet appropriately, as well! We do a lot of beans, which we all love, but she still seems to love to “carb out” on crackers and snacks rather than having a healthy lunch of hummus and veggies or something. . . I’ll be interested to see how it goes for you guys! Cindy, I know Maya’s diet has had A LOT to do with this — NOT to belittle Maddie, but you know what I mean. Her commitment rests not only on her own choices but ours as well – and if she’s serious, then I am too. John and I were vegetarians for a while, but that was years ago, long before my imposed salt free diet. Everything’s more appealing when it’s by CHOICE! If you have any recipes to share – even with salt – I’d love them. It’s easy to adapt things and often a dish will inspire others. I want to be as supportive as possible, without having to make two separate meals each night. Not enough time in the day as is!! I was pescetarian for about 3 years and then I really wanted a chicken sandwich. Wonderful, Steph!! Thanks so much for the ideas. We have tofu in the fridge for tonight — I almost always make it this way – but I’m off to Nasoya now to look for something new + SAVINGS! Glad I read your blog before one of my nieces becomes a pescetarian too. I’ll be all “in the know” now. Joy, thanks so much for the link and suggestions!! I will definitely check it out! I’ve always loved beans, so I’m no help at all. And of course the best way to eat beans is with a load of hot dogs, so that REALLY doesn’t help. Unless they’re fake meat dogs, which I heartily enjoyed in my years of hey-guys-look-how-novel-I-am vegetarianism. I really would love to know what those Whole Foods cashiers are thinking about you and all those beans! Now that I’ve wiped my mouth. Yes, those cashiers eyeball me a little warily, likely suspecting I am a very gassy person with those 20 cans of beans. Or maybe they just think I’m a freak. Who knows? I was thrilled last trip b/c the cashier turned out to be a FRIEND of mine!! So she already knows I am a freak. My 13 yr old daughter has been an obsessive fish/ seafood eater since she was tiny. She became a pescetarian about 2 months ago. She too is not embracing the beans or greens we had insisted she increase if she remains pescetarian. Oddly – she is having weird heart arrhythmia (heart feel like it skips beats, brief shortness of breath). I read online a diet high in carbs and low in magnesium and L-carnitine (found most in red meats) can often trigger these symptoms. My question is did any of your children experience anything similar to this when they became pescetarian? Before I drag her off to be poked & prodded I think we need to tweak the diet and hoped you may have advice. Hi D – So sorry to hear about this. I wish I could offer some assistance, but my daughter went off the diet almost as quickly as she’d begun. If it persists, I would strongly recommend seeing her doctor as well as asking for a referral to a nutritionist. Wishing you best of luck & much health.